1) I do it because I can. If I have been so blessed with knowledge or a skill, isn't it silly to hold it back from the people that are close to me? 2) I do it because it allows me to hang out with them. I refuse to have a car dropped off to be fixed, nope! If you want me to fix your car, you are going to help (after all, that's how I learned). I like the company. I don't think people visit enough anymore (including me). When I was growing up, at least 3 people a week would show up at the house randomly to talk to my step-father. People are fun (most of them). I love it when people want to just hang out. 3) I do it to serve. We are supposed to be ambassadors of Jesus, and he helped people any way he could. Since I really stink at healing the blind and multiplying the fish and bread, I will work on their cars, fix their computers and whatever else I can offer. It is what we are supposed to do and who we are supposed to be. I don't always get it right but at least there is an effort. 4) I do it to save them money. Brake jobs and most repairs are costly. If you just get the parts, We can do the rest for free. Thats $40 vs $150 or more because they always find other stuff to fix. 5) Sometimes I simply do it because you asked. Are we willing to say yes to each other? I think saying yes can be an act of worship. Don't get me wrong: Saying NO can also be an act of worship. My wife too often has been left on the sidelines when I "help" people. So when I can, I will. When I shouldn't, I will not...at least not then. If you haven't figured it out by now, you may never. This post is not about brakes but serving. I hope it has encouraged you to look back at yourself and ask: What am I doing for _________? If anything, why am I doing it? Is my heart right? I think serving is like vitamins for our spirit. If we are not doing something, we are not "getting" what we need. Thats right, I said "getting". We get by giving but we shouldn't give TO get. If you need your brakes don't, ask but don't be surprised if I ask you who and how you are serving. How is it that my heart can be so full and thrilled and yet at the same time hurt. Well I think that just may be the heart is supposed to be. I think there probably should be a balance between the two. Too much hurt is depression and too much joy is...well.. It's kinda annoying! Really: they both, in abundance, are not the best of company. There is good in this world and there is bad in this world. We must learn to embrace the good and the bad alike. When there is a win, we should celebrate it. We should honor God for providing it but never forget that there are hurting and lost people in this world too. So let's try to rejoice with the good and hurt for the bad. After all, isn't pain simply a call to action? When our bodies hurt, it is telling us that there is something wrong and it needs fixing. 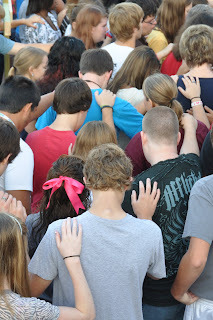 This morning was the See You At The Pole where Christians are to meet at the school flag pole ate 7am. We had an amazing group of about 12 Crosslink teens and at least that many from other churches. Yes, 24+teens up early to pray for unity in the schools and for their leadership, well, that is awesome. It is exciting for believers (of different churches) to gather together to pray. Truly amazing. I was and am honored to stand with these teens and adults. I pray that this day made a difference in the lives of these teens. Then the flip side: (after all, you didn't think I was only going to focus on the good did you? There is over 2000 students at South Central (where we met) yet only 24 at the pole for prayer? I know for a fact that over 45 of Discovery Church teens got the message. Where were they? Not just my other 33 but the ones that go to all the other churches! It brakes my heart to know that they couldn't set aside a few minutes to stand up and bee seen and to pray together. Hostly if someone had told them there would be doughnuts there, I am thinking the turn out would be better. I have often found pride in how many teens get up early for Ihop on every single early release day yet only 12 of my students came to this. once a year I ask, no I expect my teens to be at the pole for prayer, to unite with other believes and to show the school where they stand. We average 38 on any Sunday night and I have to tell you that only a handful showing up hurts. It will be better next year (or before that). I will continue to pour into the people in my reach, to be here for them and to love them. I celebrate that 12 came out that may not have ever been there without people like the Discovery church staff. After all, that is what we are supposed to be doing. Pouring into others. That is the way we show Gods love. That is the door that allows the message of Jesus' death burial and redirection to be received. I thank those who came out today, I pray for you and those who didn't. Next year we will make our stand known loud and clear. Hold me to it! Let the loving begin. Spoiler alert: I will not attempt to answer anything with this post. Instead I promise you only more question. So if you came here searching for answers, you might want to leave now. I go home merely being entertained and possible with a little more knowledge that I probably will not ever put to good use. So what is this all about? Well, I have done the exact same thing at many churches. Too many people (including me) leave Sunday afternoon unchanged from Sunday morning. I dare to say it is possible to encounter Jesus and not be even a little bit changed. I mean: He said He came to give us life and that more abundantly didn't He? So where is the change. I was once told that I had a tire going flat. with nowhere to fill it up, I had to drive it that way. The information of a low tire certainly changed my driving. I was more cautious and aware of my surroundings. I drove careful. I changed. When I got a particle in my eye working on a car one time, I changed, now I wear safety glasses. Why is it we can sit and hear what we claim is the word of God and yet still walk out of church unchanged. With warnings and promises coming straight from our Creator, i would think we would change. Well I for one am ready for some change. I am so glad that Discovery Church is starting this new r12 series. We are digging into what God wants from us, what true spirituality really is. And I hope I come out of it changed. We will be studying Romans 12 and looking at what the Bible says about who and how we should be. I always leave unchanged yet willing to come back. Just because I come back, don't mean I come back different from the last time I left unchanged. So my prayer is that God will change me, That I will allow Him to, and that in six weeks, I will be a better disciple that I am today. Thanks for reading...hope it challenged you to change. 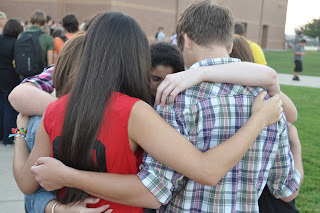 This Month on September 28th Students all over the USA will meet at the school flag pole to unite in prayer. Last year I had the honor of meeting up with South Central High School students and it was an amazing sight. The longest prayer Jesus made is recorded for us in John and 17 and has a reoccurring theme of UNITY. This event is a picture of just how powerful unity in the body of believers can be. So On Wednesday September 28th be at your schools flag pole with your friends and be a part of the unity! Discovery Church's, Crosslink teen ministry will be there in force! Matt 8:31, Matt 9:32, Matt 12:10, Matt 12:14, Matt 14:35, Matt 16:1, Matt 17:3, Matt 17:14, Matt 18:21, Matt 19:13, Matt 19:16, Matt 20:20, Matt 21:7, Matt 26:62, Matt 27:18, Matt 27:34, Matt 27:48, Mark 1:30, Mark 1:32, Mark 1:34, Mark 2:4, Mark 2:18, Mark 3:2, Mark 3:6, Mark 5:10, Mark 5:12, Mark 5:17, Mark 5:22, Mark 6:54, Mark 7:1, Mark 7:5, Mark 7:26, Mark 8:11, Mark 8:22, Mark 9:15, Mark 9:20, Mark 10:10, Mark 10:13, Mark 11:21, Mark 12:13, Mark 14:1, Mark 14:10, Mark 14:45, Mark 14:46, Mark 14:51, Mark 15:10, Mark 15:16, Mark 15:22, Mark 15:36, Mark 15:39, Luke 4:38, Luke 4:40, Luke 5:1, Luke 5:18, Luke 5:29, Luke 6:7, Luke 7:17, Luke 7:20, Luke 7:36, Luke 8:4, Luke 8:32, Luke 8:37, Luke 9:10, Luke 10:25, Luke 13:1, Luke 13:31, Luke 14:15, Luke 14:25, Luke 16:14, Luke 18:15, Luke 18:43, Luke 19:39, Luke 20:27, Luke 22:2, Luke 22:4, Luke 22:6, Luke 22:66, Luke 23:3, Luke 23:55, John 1:40, John 7:43, John 8:4, John 10:42, John 11:3, John 13:2, John 19:12, John 19:32, Acts 3:16, Acts 13:27, Hebrews 13:15 Matt 4:4, Matt 4:19, Matt 4:21, Matt 8:24, Matt 9:1, Matt 11:20, Matt 12:22, Matt 12:46, Matt 13:24, Matt 15:3, Matt 15:10, Matt 15:23, Matt 15:39, Matt 16:4, Matt 16:23, Matt 19:8, Matt 19:11, Matt 19:17, Matt 20:23, Matt 21:10, Matt 21:23, Matt 22:34, Matt 24:3, Matt 26:20, Matt 26:23, Matt 26:25, Matt 27:3, Matt 27:14, Mark 1:10, Mark 1:16, Mark 1:21, Mark 1:35, Mark 1:38, Mark 1:43, Mark 2:4, Mark 2:13, Mark 2:14, Mark 2:23, Mark 3:3, Mark 3:4, Mark 3:13, Mark 3:23, Mark 4:1, Mark 4:9, Mark 4:13, Mark 4:33, Mark 4:28, Mark 5:2, Mark 5:8, Mark 5:9, Mark 5:18, Mark 5:32, Mark 5:35, Mark 5:38, Mark 6:1, Mark 6:6, Mark 6:39, Mark 6:45, Mark 7:14, Mark 7:24, Mark 7:31, Mark 7:33, Mark 7:36, Mark 8:5, Mark 8:15, Mark 8:23, Mark 8:25, Mark 8:26, Mark 8:30, Mark 8:33, Mark 9:9, Mark 9:12, Mark 9:19, Mark 9:21, Mark 9:28, Mark 9:30, Mark 9:35, Mark 10:1, Mark 10:17, Mark 10:46, Mark 11:1, Mark 11:12, Mark 11:27, Mark 12:15, Mark 12:28, Mark 12:38, Mark 12:43, Mark 13:3, Mark 14:16, Mark 14:17, Mark 14:32, Mark 14:61, Mark 15:2, Mark 15:44, Mark 16:11, Mark 16:12, Mark 16:14, Luke 4:23, Luke 4:38, Luke 4:42, Luke 5:12, Luke 5:13, Luke 5:14, Luke 5:16, Luke 5:20, Luke 5:27 (twice), Luke 5:34, Luke 6:1, Luke 6:5, Luke 6:8, Luke 6:12, Luke 7:1, Luke 7:11, Luke 7:15, Luke 7:21, Luke 7:24, Luke 7:43, Luke 7:48, Luke 7:50, Luke 8:1, Luke 8:22, Luke 8:27, Luke 8:29, Luke 8:42, Luke 8:49, Luke 8:52, Luke 8:55, Luke 9:1, Luke 9:18, Luke 9:21, Luke 9:28, Luke 9:51, Luke 9:55, Luke 10:28, Luke 11:1, Luke 11:14, Luke 11:17, Luke 11:27, Luke 11:29, Luke 11:37, Luke 11:38, Luke 11:46, Luke 11:53, Luke 12:1, Luke 12:14, Luke 12:22, Luke 13:10, Luke 13:18, Luke 13:22, Luke 14:1, Luke 14:12, Luke 14:16, Luke 15:3, Luke 15:11, Luke 16:1, Luke 17:1, Luke 17:11, Luke 17:20, Luke 18:1, Luke 18:9, Luke 18:27, Luke 18:29, Luke 18:31, Luke 18:35, Luke 19:4, Luke 19:28, Luke 20:17, Luke 20:41, Luke 20:45, Luke 21:1, Luke 21:5, Luke 21:37, Luke 22:8, Luke 22:13, Luke 22:14, Luke 22:25, Luke 22:34, Luke 22:35, Luke 22:39, Luke 22:67, Luke 23:3, Luke 23:7, Luke 23:9, Luke 24:28, Luke 24:35, John 9:22, John 11:43, John 11:57, John 12:9, John 12:37, John 13:28, John 18:6, John 19:41, John 20:9, John 21:15, John 21:16 (twice), John 21:17, John 21:19, Acts 1:22, Acts 9:20, Hebrews 2:11, Hebrews 7:24, Hebrews 8:6, 1 John 2:6, 1 John 3:16, Luke 20:20, Acts 3:16, Acts 13:24 Matt 17:24, Matt 20:29, Luke 10:38, 2 Cor 11:4. I may be mistaken about the best translation to use, I may be mistaken to use these verses as an example, I may be mistaken about a lot. But I am not mistaken about the Blood of Jesus Christ that was shed for my sins. It is to God I am thankful for His mercy on me. Are the accusers working out of love? And further more, is there more than the work on the Cross and the resurrection of Jesus that I need for salvation? Sitting on the beach in the early morning and all of yesterday's footprints and sand castles are gone. No sign or trace that they were ever here. No amount of offending footprints can withstand the redemptive power of the tide and the wind. Like our sins and the power of Jesus blood. Not a trace. To God, we are a smooth beach, a fresh canvas every day-every minute. Us back as if it wasn't forgiven. I pray that we can start seeing the redeeming blood of Jesus Christ like the tide and wind. As soon as the sand is disturbed, the beach goes to work restoring it. And it is always successful. The work is done, let start acting like it. Click here and put in your info. A few others and myself get these. It is the same verse every day for a week. To help you memorize. It's Saturday and there is a certain calm before the storm. A moment to breath. Please don't get me wrong, the storm that is coming is a great thing. It is out teen week at church. We call it CTO for Crosslink Take Over. They will do everything! Last year I was a huge part of the message and no, I am not a teen, tho I am a part of Crosslink. This year I have been kicked off of the stage. Two of my amazing teens want to deliver a message that God has laid on our hearts. Every time we meet to plan, I get more exited. This is a message that people need to hear, the music they will play and the food and greeting that will happen. In addition to this amazing Sunday we will be selling lunch on the grounds to finalize our camp fundraiser. This will be a crazy next couple of weeks. We have a lot to do and I am not one who likes to give up control. Pray for out May 15th event: that God will speak though these kids, that the people will accept the message given them, that we will pull it all off and that God gets the credit for the whole thing. So in order to better focus on listening to God: starting Monday, I will be logged off of Face Book until after the event. That's two weeks from tomorrow. This will be challenging form me since FB is the primary tool I use to communicate with the teens. Their post tell me how they are doing and even sometimes tell me what they need. I will not fast from loving them, they will just have to watch their phones for text and check there....wait for it...Emails!!! Who knows: maybe they will see a little something from me in the mail (check that box out by the road!). I want to better at listening to God and recognizing His voice. I promise: they more you actually listen, the more you will hear. So I am sitting here on my swing, in an amazing 72 degrees and a nice breeze. The dogs are playing, and wanting me to play and I am enjoying the calm before the storm. Be in prayer, be listening and be at 621 W. Firetower Rd,Winterville, NC 28590 on May 15th at 10:10am. Turn up the volume! This message needs to be heard!!! I have been doing a lot of thinking about Discovery Churches youth ministry called Crosslink. This group of teens as been growing and growing strong over the past year. Before that, we had a good flow of teens coming but not like this. We are blessed with several visitors each week and the leaders really haven't been doing any inviting. So where are they coming from? Well the teens are inviting them. They are engaging their friends in conversations about God, Jesus and the Bible and apparently in a way that actually draws people in rather than push them away. Crosslink is growing from the outside in. These kids get it. They are not leaving the work up to the pastors and leadership, they are out there BEING the church in what we are calling the “between Sundays”. Make no mistake: this is NOT some plan or strategy that we are pushing. It is not an attendance program. It is simply Teens letting their faith show through in their daily lives. It is something that THEY are teaching us. And I want to celebrate that! These kids have become some of the most influential people in my life. I thank them all for that. Let me assure you that I am not concerned with how many teens we get there on a given Sunday night but do be assured that I am thrilled that these kids are showing fruit. The Kingdom is growing and our Sunday night numbers are showing that. Discovery Church is focused on making disciples of Christ by Deepening our relationship with God and believers, By Doing something to serve God and others and finally by Developing relationships with unbelievers. I think it is this last “D” that the teens really get. Them being more social than us grown-ups, they shine in the Developing were we are naturally better at the Deepening and Doing. So maybe we can all learn from each other and share our strengths, work on our weaknesses and celebrate the “Wonders of God”. Thank you for still checking my Blog, you are all awesome for putting up with my lack of maintenance here. See how Camp Caswell inspired us! I am sitting here feeling nothing less than blessed. How did I wind up here? I have 50+ teens and 25+ kids in my life that totally make my week, every week. Each and ever one of them have a spot in my heart. I hurt when they hurt, I am happy when they smile. These teens/kids make a difference in my life. They bring me joy and that is the best I could hope for. If you are reading this and you are one of my ROCK’rz or one of my Link’rz: I am talking about you. I know you think I am here to serve you and the church but you all pour so much into me that sometimes I think you are the ministers. As I write this I am picturing your faces, your smile, how much you have grown and how much I am going to miss you when I cant see you each week. I don’t know how you really feel about yourself but I do know that you matter so much to Sheila and I. Rarely does an hour go buy that one of us isn’t talking about you. I love what I do, I love being able to be with you all and you are a blessing from God to us. THANK YOU! 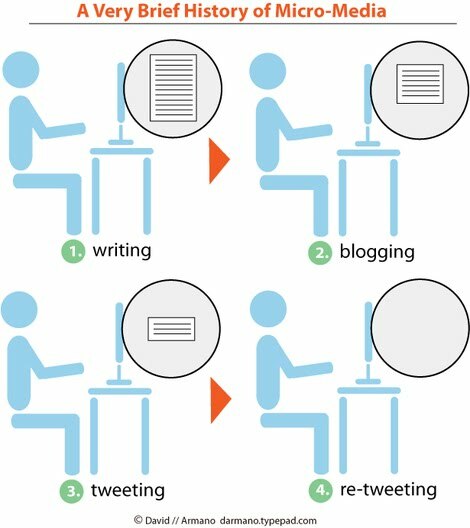 Are blogs dead? I don't know but when I have more to say than FB will allow, I will jump over here to post it. Other than that: Life is great! Sheila is awesome, my family is great and I am still loving serving under Pastor Jason Ebeling at Discovery Church. So I am thanking and praising God for anther great beginning to a great year.